So I posted a few days ago about this girl becoming available on Amazon, and thanks to Prime – HERE SHE IS! I’m going to warn you. 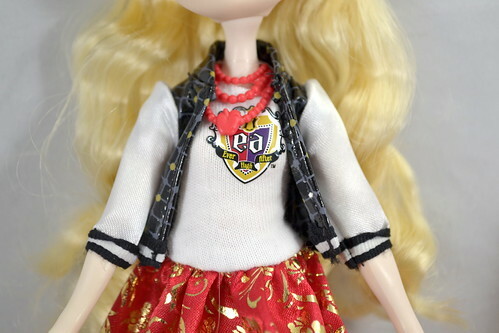 I am extremely excited about new Ever After High, so this review is going to be biased. I LOVE HER! Her packaging is adorable! 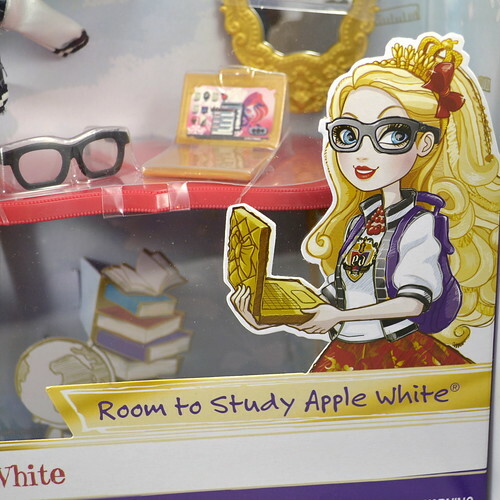 This is the Room to Study Back to School Apple White. You can’t see the Back to School logo at the top right because of the glare. 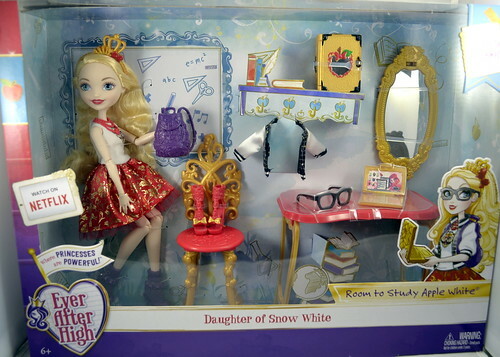 I was worried at first when I saw the doll, because I could tell something was missing, but then I saw the jacket in the packaging like it was hanging on a hook. CUTE! Totally saving this art! How adorable! The back of the box made me more happy than the front, though, I must admit. DO YOU SEE THAT ART! 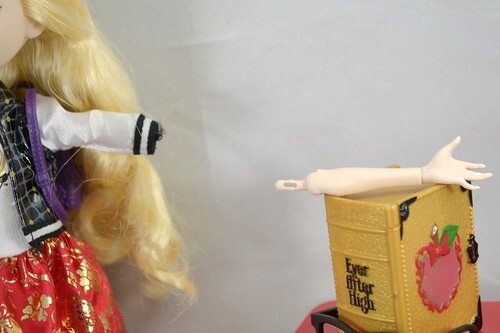 Those dolls have listings on Amazon! 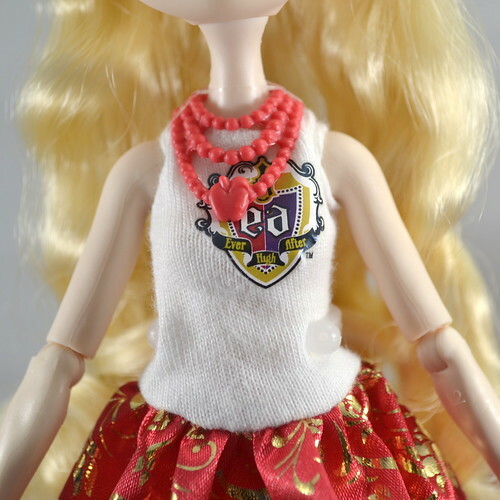 Meeshell, Holly, and Maddie are listed as unavailable right now, but with this doll coming out and seeing their art on the back gives me hope! Out of the box, we see that Apple comes with many different things. Can you spot all the reused pieces? I’ll start with the doll, because let’s be honest. That’s what I’m here for. 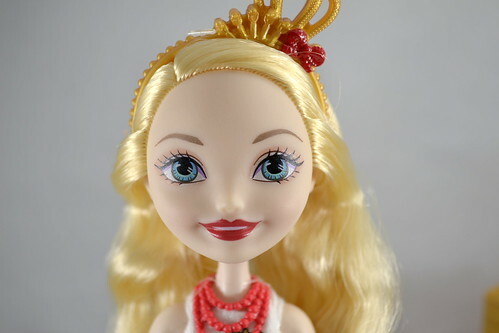 This doll features the smiling face of the new line. This is my first Apple with this face and I have to say that it’s adorable! Her eyeshadow is hardly noticeable in real life. 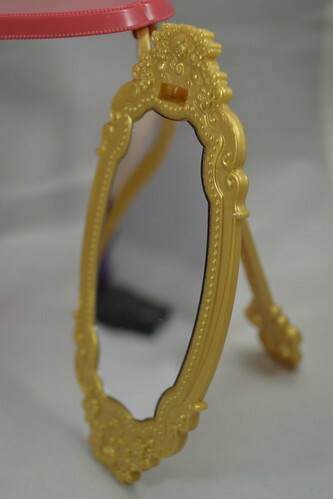 It’s more reflective than the photos shows, too. She has bright red lips that are open in a smile. I don’t think this headband has been used before. Has it? 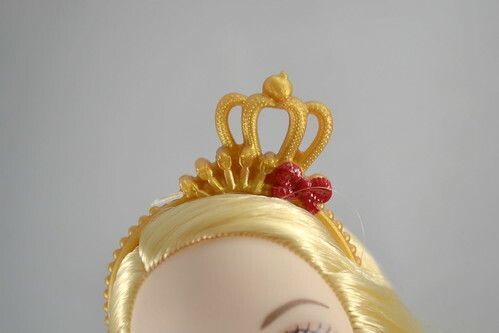 It’s a crown with a little bow. BOWS! 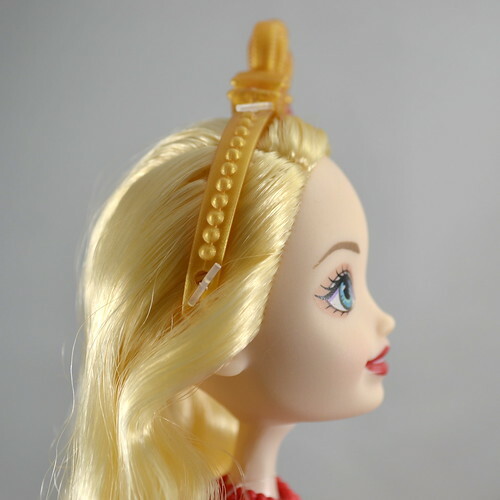 The doll does not have earrings or pierced ears. The headband is attached with those little tabs. I think for now I am going to leave them in. 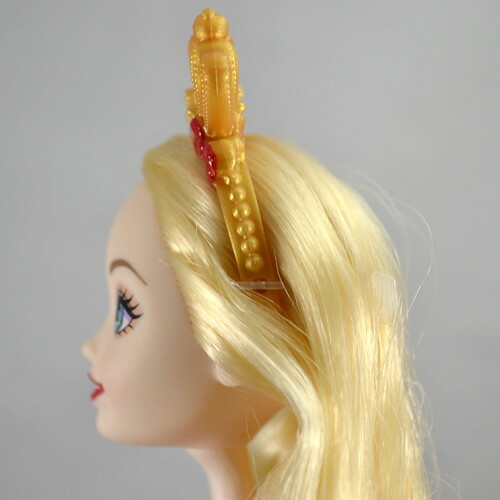 Okay, so for me there are two major things I want in a doll: Articulation and great hair. 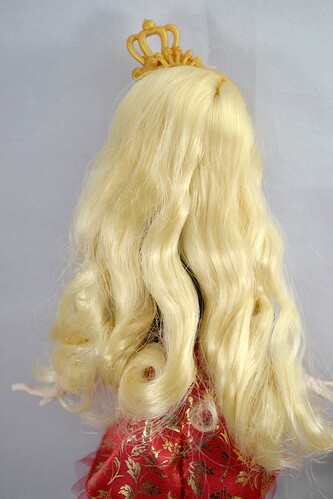 AND O-M-G does this doll have great hair. Okay, so it looks like she just came out of the box right now, BUT IT IS SO SOFT! Like so soft! Heaven in hair form. 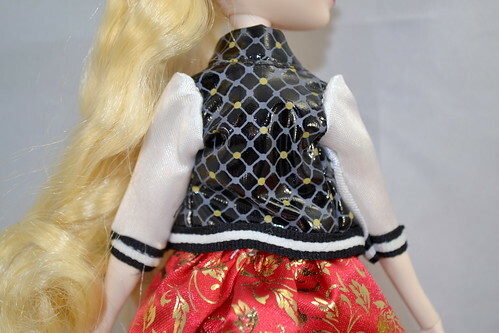 The doll’s dress is one piece. The design of the skirt does go all the way around the back. The dress closes with velcro. 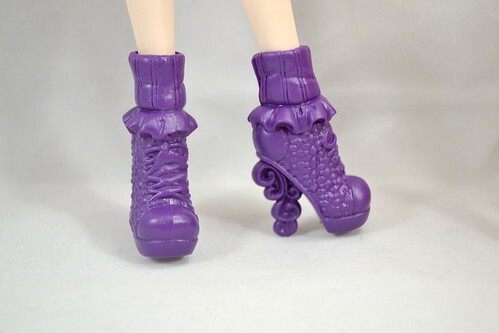 The doll comes wearing purple heels with a purple non-painted ruffle at the top. These red shoes were also in the box. 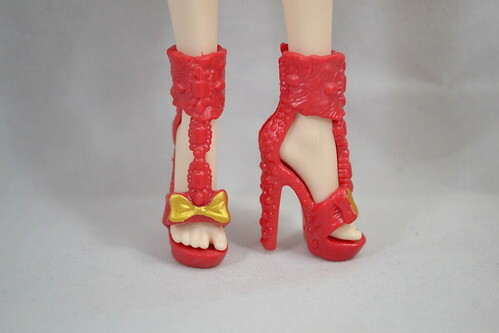 Are these from the shoe playset? Or somewhere else? Let me know. The jacket is a 3/4 sleeve jacket that does not close in the front. The design continues all the way around the back. It was right around now when I noticed a problem. I tried to pose Apple with her hands on her hip and POP! Look what happened! Her arm just came out of its socket! What! It easily popped back in, but that startled me!! I totally didn’t notice it until AFTER I thought I had broken my doll, but the packaging does confirm, she is supposed to be able to do that. Whoa! 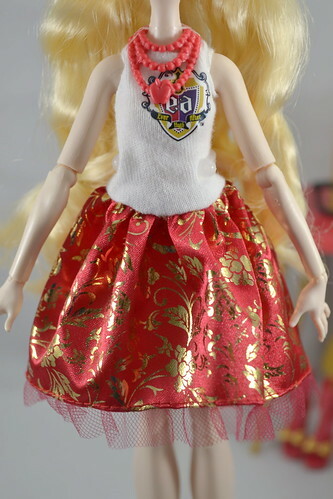 So everyone is going to be quick to point out the similarities between this doll and the School Spirit doll. I wanted to take a minute to point out their differences. Many people who already have one will probably pass on this doll, but I am VERY glad to have the new doll. 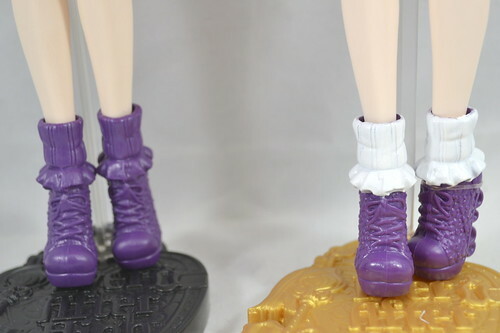 The first major difference is the dolls themselves. 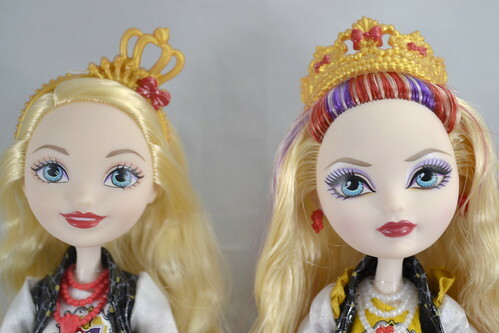 The older doll has a very stern expression, whereas the new doll is all smiles. 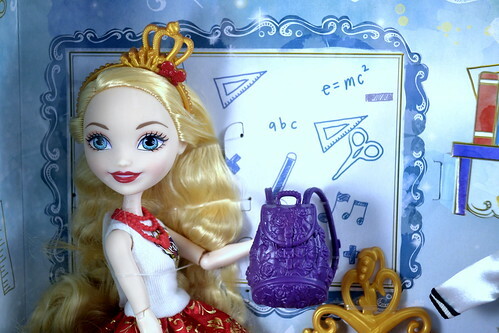 I like the lipstick on the old doll, but I always thought she looked annoyed at being forced into school spirit, which isn’t really in Apple’s character. As for their accessories, this new Apple has a different crown and no earrings. There are subtle differences in their outfits that makes me happy. First off, I HATED that yellow top on the older Apple’s dress. Like where did that color come from?! And I know that the purple tulle is supposed to tie the older doll in with the Raven doll from the set, but I never liked it. 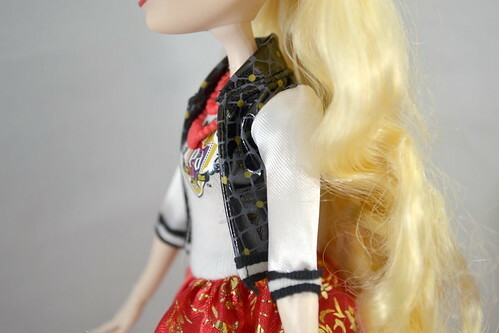 The new doll doesn’t have the gold ruffles on her jacket either. Their necklaces are the same, except for the coloring. The skirt print is different, too. 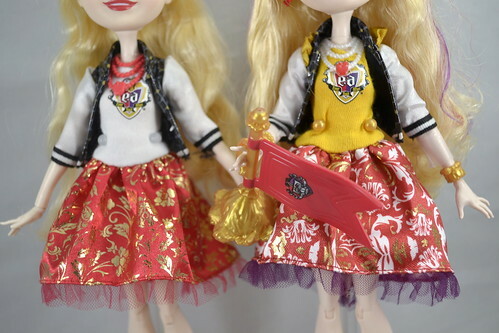 I think it’s easier to see the difference in the skirts here. I kinda like the more simple gold pattern. The only difference in their shoes is a little bit of paint. So that’s the doll. I think she is adorable and totally worth it. I think she is different enough for me to get her as a “gotta-catch-‘em-all” collector. But I can see the complaints that are going to come already…. 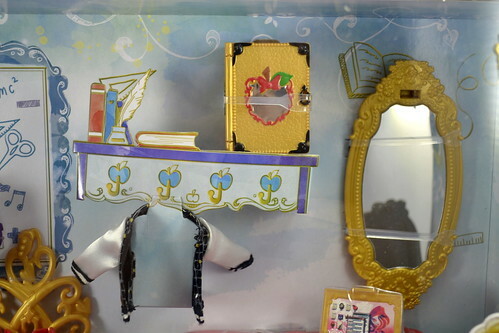 Other than the doll, the box also has several accessories. 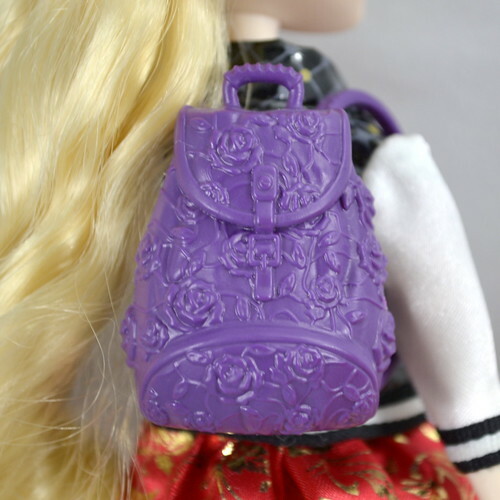 This purple backpack with rose details may be better for Briar, but I can totally see Apple rocking it. 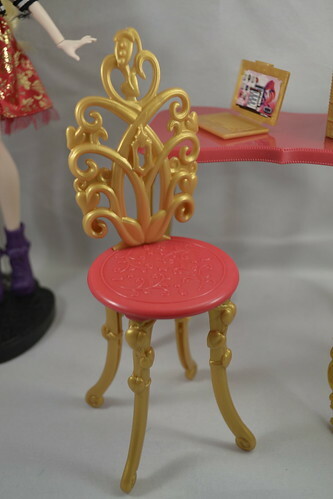 This chair is adorable and Apple enjoys plopping down after a long day at school. 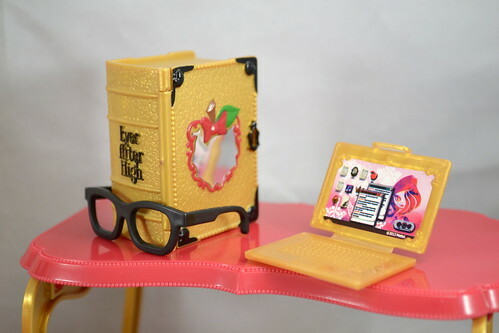 The set also includes a table, massive book (The Storybook of Legends), glasses, and a laptop. The laptop is identical to the one sold with the fainting couch. 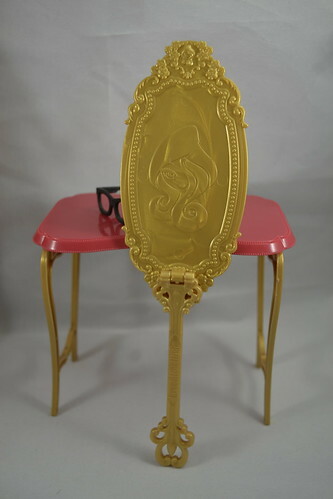 The glasses are the exact same, except the ones with the fainting couch are more glossy, whereas this plastic is more flat/matte black. I believe this came with the shoe store playset? I haven’t bought that yet (Whoops! Gotta get on that! ), but I think it is also found there. I could make that smiling signature Apple! I think this is how I’m going to keep her, actually. I really like this look for her. 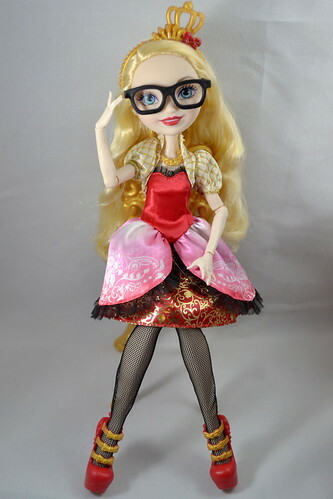 This doll is SO adorable! The playset may have recolored or reused pieces, but I’m actually not complaining. I could ALWAYS use more of those adorable glasses and the laptop! 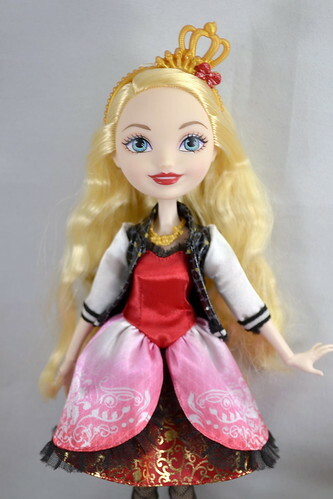 Previous PostNew Ever After High on Amazon!Next PostOur 3D Models are now on Thingiverse! 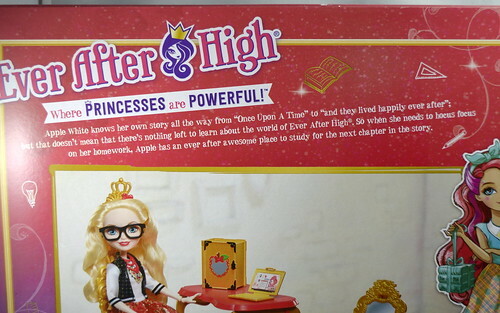 I believe her crown is the same as the one from the ‘powerful princess club’ apple. Even being sort of a re-issue she’s very cute and I definitely like that new dress more than the SS one. Great review!! I’m so excited as well and she is totally adorable. This is actually the first time I’ve been really tempted to get a new smiling Apple face. I like her better than the School Spirit Apple (which I don’t have.) I’m so glad to hear you like her so much! Thank you for your review! So good to see someone who is as excited about this set as I am (although I don’t even own it yet). 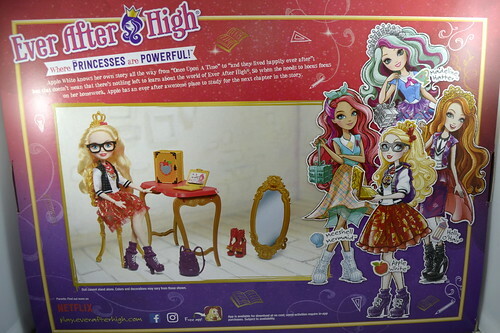 But I have one question: this set doesn’t come with a stand for the doll, right? 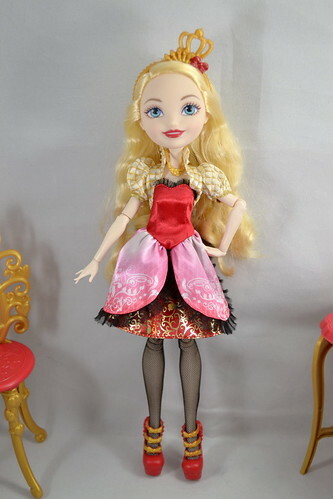 Would be great if there were a stand but I can live with a beautiful doll like this Apple without a stand! 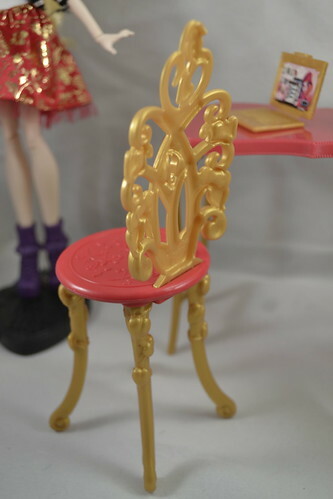 You are correct in that this set does NOT come with a stand. I was lucky enough to spot a collector online that was getting rid of a large lot of MH and EAH stands that I grabbed up quickly. Unfortunately, as many of these releases are like this…. I’m running low. So! If anyone wants to get rid of some stands…. hit me up! The shoes are recoloured Thronecoming Apple’s.